There is a lot riding on selecting the best aquarium filter. Fish and live plants produce waste and detritus. Uneaten food can accumulate and break down. Even dust from outside the tank can find its way inside and settle into the aquarium. A filter removes all of this waste and ammonia, cleaning the water. Clean water keeps fish and plants healthy. Clean water is also clear, ensuring there is excellent visibility into the tank, so the aquarium can be enjoyed. 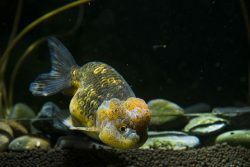 If the water in an aquarium is not filtered, or if an ineffective filter is used and the waste is not removed is can pose a serious health risk to both fish and live plants. 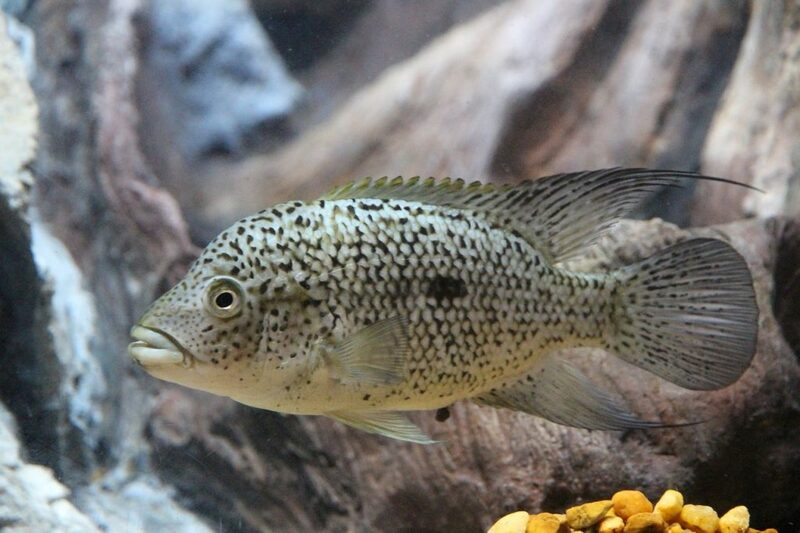 Fish tank filters also aerate, or oxygenate, water. Introducing movement, or a current, which helps move water from the bottom of the tank to the top to pick up oxygen and release carbon dioxide. A lot of factors need to be considered in order to find the best filter for your aquarium. The ideal fish tank filter depends partly on the size of your tank and the type of fish in the tank. Some fish, for instance goldfish, produce more waste than others, so if you keep goldfish you need a filter that can keep up. A key trait of any aquarium filter is Gallons Per Hour (GPH). This is a measure of how many gallons of water the filter can process in one hour. In order to determine the ideal GPH for your tank, you need to determine the ideal flow rate. The flow rate is how many times all of the water in the tank should flow through the filter. Depending on the size of the fish tank and the number and types of fish and plants in the aquarium you may need to turn over the water as few as 3 times or as many as 10 times in one hour. No two aquariums are the same, so when searching for a filter for your fish tank consider the size of the tank, the type and number of fish, and how much time you have to take care of maintenance. Filters contain sponges or cartridges that need to be changed on a regular schedule, so factor in your time and the expense of new filter mediums when choosing a fish tank filter. Once you have evaluated all of these aspects you can determine how often the water in your tank needs to be turned over. From there you can determine the necessary GPH. 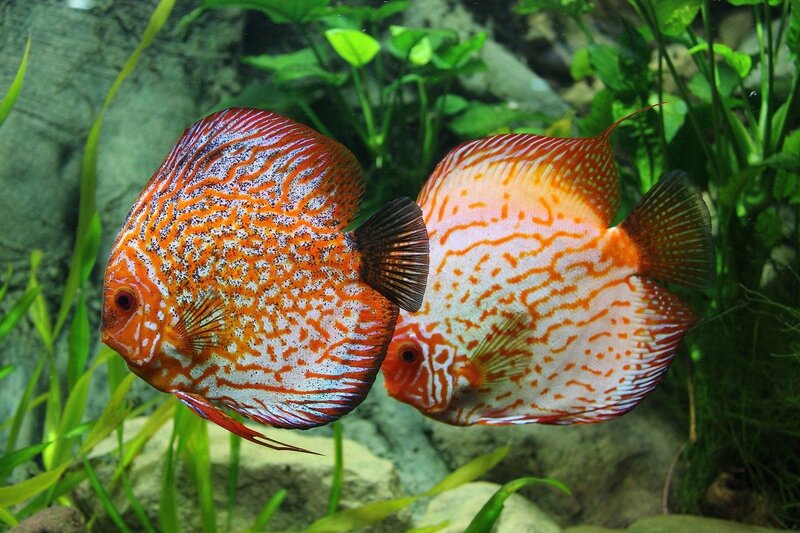 A high GPH is necessary in aquariums that produce a lot of waste, or are very large. It is possible to have too much water flow in a tank. Water flow in a tank generates a current, and some fish do not do well in that type of environment. For example, fry and betta fish prefer low current. It is also very likely that clean water released from a filter will immediately be pulled back into the filter. This can create a cycle where only some of the water in the tank is cleaned. Look for filters that have a spray arm which releases clean water further away from the intake. This will minimize clean water being sucked back into the intake, and ensure more water in the tank is filtered. Internal filters are typically used in smaller tanks, or as backups to support external filters in large fish tanks. Everything in a fish tank will impact the efficiency of the filter. Plants or decorations can impede the flow of water through the tank. Placement of your aquarium may also determine the best filter for your fish tank. An internal submersible aquarium filter is placed inside a tank, and is ideal if there is no space available outside of the tank for an external filter. The tradeoff is that an internal fish tank filter will take up space inside of the tank, and aquascaping will need to be arranged to accommodate the filter housing. The Aqueon Quietflow Internal Filter is a versatile filter that can be used in an array of aquariums. This fully submersible fish tank filter can be installed in a vertical or horizontal position for flexible placement. The low profile design takes up minimal space and does dominate the tank. Quiet operation means this filter is not disruptive for a welcome addition to any aquarium or home. The return flow rate is adjustable, as well as the height and direction of the water return. By adjusting the water return the impact of the current can be minimized to reduce disruption to fish or aquascape, while also directing clean water away from the intake. Three stage filtration allows this filter to deliver excellent results. Dense foam filtration removes particles and debris. Activated carbon filtration removes toxins, odors, and discoloration. BioGrid filtration takes care of ammonia and nitrates for a clean and healthy environment. This submersible fish tank filter comes up multiple GPH ratings, including 15, 20, 30, and 40. The replacement filter cartridges are proprietary. The cartridges are expensive and per the manufacturer’s instructions the cartridges need to be replaced very frequently, making it expensive to operate this filter. The space saving design of the Aquatop Internal Filter makes it an unobtrusive addition to any fish tank. Vertical or horizontal mounting options allow for flexible placement within an aquarium. The spray bar pivots, so it can be adjusted to disperse water in any direction and best suit different species of fish and aquascaping. The surface agitation caused by the spray bar works to oxygenate the water. Multiple return options provide added flexibility. The dense filter sponge offers improved filtration to keep the tank water clean and create a safe habitat. The energy efficient design allows for effective operation without draining power. Model IF-201 is best for smaller tanks with about a 10 gallon capacity, and it can process 42 GPH. The next model in the series is IF-202, which is intended for 20 gallon tanks, and it can accommodate 58 GPH. The final filter in the series is the IF-204. The top model is designed for 40 gallon tanks, and it can filter 119 GPH. The adjustable flow rate is not very pronounced. There is not a noticeable difference between the settings. The filter is not very quiet when it is operating, which can be disruptive depending on where the fish tank is placed. 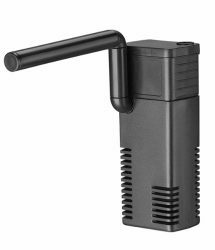 Whether you have a freshwater or saltwater aquarium the SunSun Submersible Internal Filter Pump can keep your tank clean and safe for your fish. 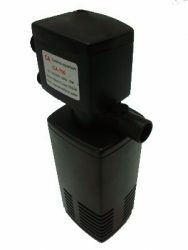 The base model, JP-042F, is a compact 5″ L x 2″ W x 1.75″ H, and can pump 92 GPH and is good for up to 20 gallons. The next model up, JUP-43F, has the same dimensions, but can handle 155 GPH and can work in tanks up to 29 gallons. Model JP-044F measures 6.25″ L x 2.75″ W x 2″ H, and has a rating of 210 GPH and is good for fish tanks up to 40 gallons. Model JP-083 measures 5.9″ L x 2.1″ W x 8.5″ D, and can pump 396 GPH and can handle up to 75 gallons. Model JP-084 is 6.6″ L x 2.3″ W x 9.5″ H, and has GPH rating of 528 and is good for aquariums up to 100 gallons. 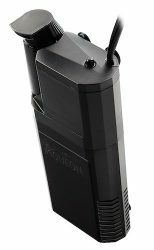 The top model in the series is JP-085, which measures 7.5″ L x 2.75″ W x 10.5″ H, and can pump 845 GPH which works well for aquariums up to 200 gallons. All models feature a spray bar that creates a surface disturbance to aerate the water while also distributing clean water as far away as possible from the intake. The three top models feature a dual water intake and dual return. In addition to the surface return there is also a directional return that can be adjusted to best accommodate a variety of setups. The JP series of filters utilizes a sponge pre-filter and a carbon basket filter to clean water. The sponge filter clogs easily, which can prevent water from moving through the filter. The sponge filter needs to be cleaned on a regular basis in order to keep the filter operational. This fully submersible filter is designed to filter and clean water, but to also provide aeration above and below the surface. The included spray bar option agitates the surface to aid in aeration. 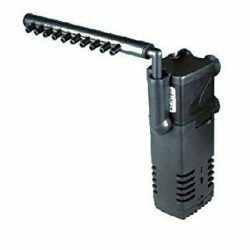 The pump head creates a current by utilizing adjustable and directional water flow. This filter features a round directional flow spout that can be connected to drive water fountains or other accessories (accessories not included). The activated carbon cartridge effectively cleans water by removing chemicals, toxins, odors, and other contaminants. The Penn Plax Submersible Aquarium Filter comes in multiple versions. The first entry in the series is the Penn Plax 170, which measures 5″ L x 2″ W x 3″ H, and can process 45 GPH for tanks up to 5 gallons. Next is the Penn Plax 300. This filter is 5″ L x 2″ W x 3″ H, and it can handle 70 GPH which is good for fish tanks up to 10 gallons. Model Penn Plax 400 measures 8″ L x 5″ W x 2″ H, and pumps 110 GPH and works well for tanks up to 20 gallons. Lastly, there is model Penn Plax 600, which measures 12″ L x 5″ W x 3″ H, and can handle 175 GPH which is best for aquariums up to 50 gallons. The casing is difficult to open, which makes cleaning and routine maintenance challenging. Without proper care the filter cannot operate effectively. The included sponge filter is of a low quality, and wears out quickly. The submersible design allows this fish tank filter to easily clip or be attached via the included suction cups, to the side of a fish tank, and can be tucked behind plants or decorative items to conceal the filter. With the motor located at the bottom of the filter housing operational noise is greatly reduced, so this filter is not disruptive. An integrated waterfall spout creates a current and helps to aerate the water. The Marina internal fish tank filters make use of proprietary power cartridge filtration. This 3-step filtration process allows water to enter at the center of the filter cartridge. Upon entering the filter in the zeolite chamber ammonia is removed. As water enters the second filter chamber carbon removes pollutants and odors. In the third step floating debris is trapped inside of the cartridge, ensuring water is safe and clear. The filter is easy to access, making maintenance quick and simple. These internal filters come in three different size options. The i25 works for fish tanks up to 6.6 gallons, the i110 is good for up to 25 gallons, and finally the i160 is good for aquariums up to 40 gallons. The water intake is very strong, so this filter is not suitable for young fry or certain species of fish, such as betta. The filter is very effective, but in order to remain efficient the filter requires frequent cleaning. The Catalina Aquarium internal filter is easy to setup, and effectively cleans and oxygenates water in fish and turtle tanks. This pump utilizes both mechanical and biological filtration, which safely converts ammonia to nitrates. The washable filter medium requires some minor maintenance, but allows this filter to run efficiently and cost effectively. The submersible design works well in both fresh and marine aquariums. The CA333F is best suited for small 3 to 5 gallon tanks. It measures 1.6″ L x 1.2″ W x 4.75″ H, making it ideal for small tanks. The CA333F can filter 80 GPH. The CA900 is bigger at 3.5″ L x 2.5″ W x 12.5″ H, and it is intended for medium 30 to 50 gallon tanks. The included air line hose easily aerates the water to create a safe and comfortable habitat. The CA1800 utilizes a powerhead triple venturi pump to create flow that mimics ocean currents, making this pump ideal for marine or reef tanks. The CA1800 delivers a powerful 650 GPH that is excellent for large tanks. The low energy consumption high-water output lock line ensures efficient operation. The CA1800 is good for large aquariums 200 to 400 gallon in size. The inlet on the air intake hose is small, which limits the amount of water that can pass through. The filter has the power to effectively handle high capacities of water, but the intake does not support the motor. Each aquarium has different filtration needs, so finding the best submersible filter takes some research. The ultimate function of a aquarium tank filter is to clean the water to create a healthy home for fish. Not all aquariums require the same level of filtration, so it is important to find a filter that is a good fit for specific species. The size of the fish tank, the type and quantity of fish, as well as plants and even ornaments all impact the filtration needs of an aquarium. Internal filters are a good solution for small tanks, or in large tanks that need multiple filters. Adjustable settings make a filter versatile, and create the ability for a fish tank filter to still be useful as different species of fish are added to a tank or as an aquarium evolves. In order to keep a filter working optimally there is a level of maintenance required. Cartridges need to be replaced on a regular schedule. Filter cartridges are vital to keeping the filter functioning properly, but they are also a recurring expense. When researching a filter it is also a good idea to research the compatible cartridges or filter medium to see how often they need to be replaced and how much they cost. Please comment on this post with thoughts, feedback, or experiences you would like to share.